Beautiful Elk as always. have fun. Always fun to stop by and see al the (red) beauty that's around you. *sigh* yes, to all of it. love your pets, so sweet. poor sam, he is starting to look old but please comfort him for me, we are all starting to look old. he is not alone. Ahhhhh, I am breathing in this moment of peaceful companionship... you have sketched it so well. Oh, I am a SUCKER for the animals and have an aged Golden like yours. SO SWEET. Thanks for sharing this lovely moment. You describe one of those everyday moments of beauty we so often let pass us by. That first photo is absolutely amazing! So sweet! A peaceful moment in time. 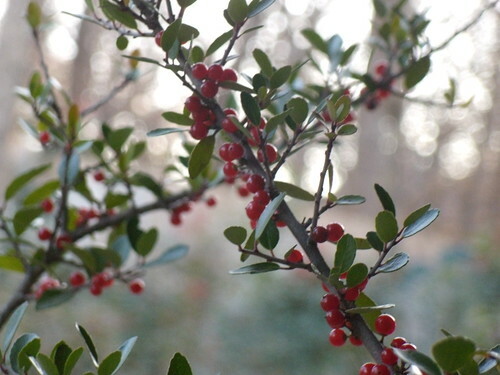 The holly bush photo is lovely! see? inspiring me again!! such beauty HERE!! Is there anything nicer and cozier than sitting with your beloved animals doing something you love? I love this pet friends portrait! My cubana hangs out whenn i am working and i know it helps ground my work. Ah I can feel the joy and companionship of the moment. beautiful. i love that first photo. oh friend, i'm waving at you: can you see me? want to have tea? So tranquil and cozy and beautiful- but I have to say, the china from the previous post is absolutely gorgeous! What a treasure!Have a good day my sweet friend! I will forever picture you like this. 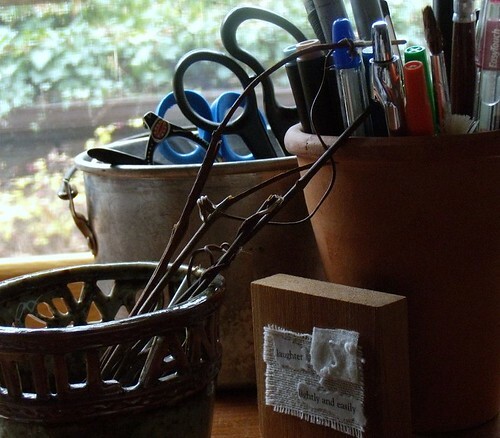 Your cat & dog seem to be enjoying themselves around your creative space. They look very happy in the sunlight. Your space is so inviting. 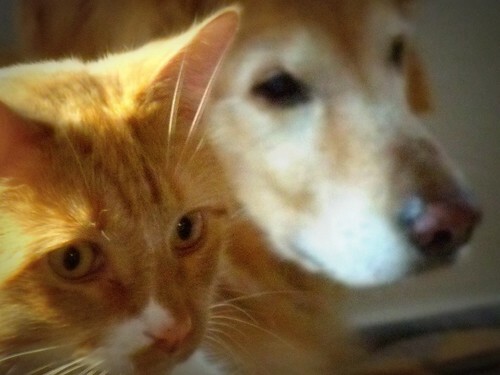 Love that image of the dog and cat together. So..so..so sweet! i've saved this in my reader so i could come back to it - gave me warm fuzzies to know you had such good company while creating.